The kitchen is the most used place in the house which causes some wear and tear on your materials over time. Bacteria, dirt, food debris and even insects are also produced here. So when building or remodeling the kitchen, we must consider using the most durable and hygienic material possible if we want to have the ideal kitchen that is also functional. 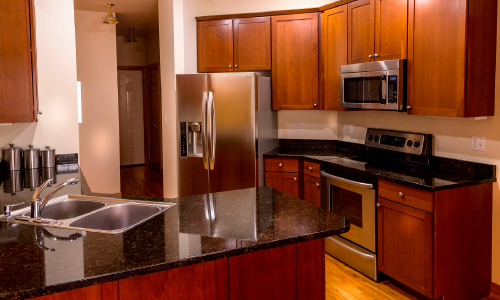 There are several resistant materials that work very well in the kitchen; in Charlotte, NC, Dream Home Builders and Remodelers as experienced on home builders we can help you in the installation of these materials. Granite and Marble: these are two types of rock, very resistant, so they work very well on floors and tops. They are very easy to clean so they are hygienic and functional. Now, between the two, granite is more resistant to knocks and scratches than marble. At Dream Home Builders and Remodelers, we have the best advisors for the installation of these materials in your home. Cement: it has begun to be used – in addition to the construction of houses – in kitchens, both floors and countertops. Polished cement is used to make it easier to clean and best of all it is cheaper than granite and other materials. This can be combined, for example, with stainless steel and work very well. An architect is helpful when creating the design for it. Stainless steel: this is the perfect material for your kitchen, both in the implements and in the finishes. It is called the “eternal”; it is the most durable, hygienic and bright material, and you can combine it with other materials and colors to bring it to life. Take modernity to your kitchen without losing style and durability. Wood: solid wood is durable and very versatile in terms of designs and styles. One of the most used woods in kitchens is pine because it is more economical, although it is the least durable. Also, precious woods such as mahogany, ebony, cedar, among others, are used extensively despite being more expensive because of their durability. You can have a traditional or contemporary kitchen, it is your choice. Tiles: classic tiles are very durable and are still a great option; their different colors allow creating cheerful designs as well as daring and traditional combinations. Currently, you can get them in different textures. From the hand of a good builder, you will achieve your dream kitchen. There are excellent quality materials to remodel or build a kitchen but it is ideal to ask for advice from professionals in interior design and architecture to help you choose the design you want; lastly, find the right contractor and experienced workforce to give life to your project with the materials that best suit your dream design.